CK Editor is used in all the tools of Etudes where composing is offered. It is simple to use, fast loading, yet robust. It also allows you to work with HTML. Highlights of its functionality are provided in this section. It is easy to miss this wonderful function of CK Editor. Maximize Window opens the compose view in a full screen, making it easier to author lessons, compose assignment submissions, etc. As you can see in the below example, you have lots of options for formatting your text using the tools in the editor toolbar. The upper paragraph text was colored in Word, copied and pasted into the W clipboard, and then inserted. The formatting remained intact upon paste. The remainder of the text was formatted directly in CK Editor using special characters, strike through, sub/superscript, text color and highlight color. No special plugins are required for this functionality. It works in all browsers. Spell checking in the CK Editor of Etudes comes in two flavors. The first option lets you open the Spell Check dialog window and check the spelling of the document word by word. The second option is the Spell Check As You Type (SCAYT) option that checks the spelling of the text in the editing area immediately as you type it and marks all errors with a red wavy line underneath the misspelled word. By default SCAYT is disabled. If you want to turn it on, press the toolbar button, and select the Enable SCAYT option from the menu that opens. After you enable SCAYT, more menu options become active. Each menu option opens a Spell Check As You Type dialog window with an appropriate tab. 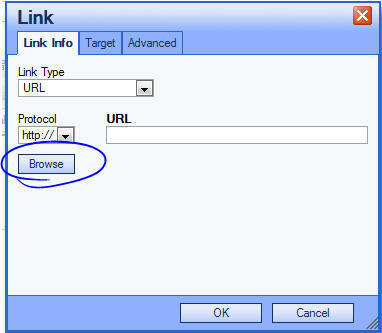 The “Save” feature in the editor toolbar enables users to save frequently and protect their work from technical glitches with browsers, connectivity, and the like. This feature is particularly beneficial to instructors in grade by question. You can click on the save button on the editor instead of scrolling all the way to the bottom to save your work-in-progress often. This is also valuable when working with the Editor maximized. You can save frequently, without minimizing the editor. The save functionality is also available to students when composing topics, messages or inline assignments. The save function is available in the editor is available in Schedule, Announcements, Syllabus, Modules, Discussions, Private Messages, and Resources. It is not available in Home Page Builder, as it has its own save functionality. When an item is in draft mode, it is kept as a draft. If an item was posted, editing it and clicking on ‘save’ in the editor keeps it posted. The save function will perform the save or save as draft, if available on the page. If not available, it will perform a Post or Done. Exceptions: Saving announcements or private messages via the save button of the editor does not post them. It saves them as drafts. 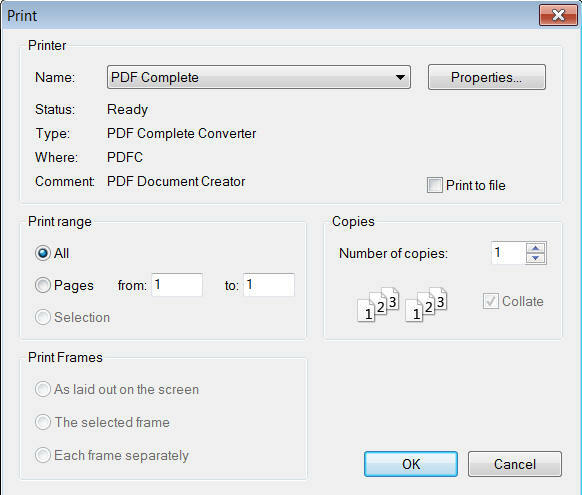 CK Editor allows you to print the document along with all its formatting and contents. The printed material will not contain the editor window or its toolbars or the menus of Etudes. Place your cursor in your content where you would like to insert an image. Click on the Insert Image icon on the editor tool bar. 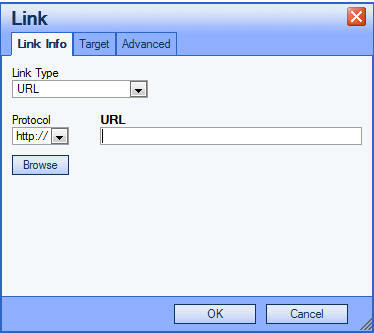 Click on Browse to upload an image from your computer (or add a URL to link to an image on the web). Find your image file in your computer and select it. The image will now be embedded in your content. Place your cursor in your content where you would like to insert a youtube video. Click on the Insert YouTube video icon on the editor toolbar. An “Embed Media Dialog” box will appear. Paste the embed code of your youtube video and click on OK.
Place your cursor in your content where you would like to insert a Flash file. Click on the Flash icon on the editor tool bar. Find your Flash file in your computer and select it. The file will now be embedded in your content. You can easily add foreign language characters to your text in this editor. Click on the icon (circled above). That opens a box full of special characters. 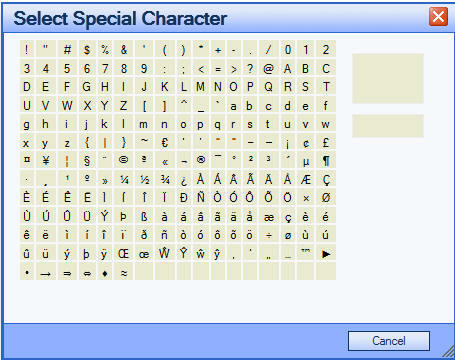 To insert one of the characters, simply click once on the chosen character. This action will insert the character into your document where the cursor was, and it will close the Special Character box. If you want to add more characters, you have to keep opening the character box and clicking on the character you want to insert. Smilies are available in all the tools of Etudes where composing is supported. 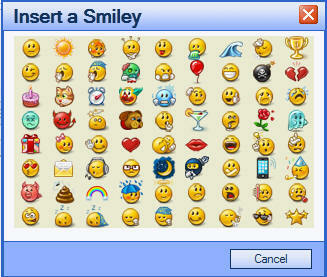 Insert smilies to add emotion to words. To open the Smilies options selection window, click on the smilie icon (circled above). When the smilies window appears, simply click on whichever little smiley icon you want to insert in your content. They will appear in your text where your cursor had been inserted. Etudes supports the creation of mathematical notations via a MathML plugin (Wiris Editor). Learn more about how to use the Wiris MathML Editor. The editor allows you to see the number of words that you have entered, as you type them. The word count feature is available to students and instructors in the editor throughout Etudes. This can be particularly helpful to students if there is a specific minimum word count in assignments. Likewise, instructors can see the total words of a submission in grading.